to the really good bread, all made to order by one of them, is a testament to what a special, special place this is. deserving of the prize. It is truly a great neighborhood restaurant. I invite all to try it if you have not done so already. Last edited by ett094 on November 11th, 2008, 8:43 pm, edited 3 times in total. Now, here's another sandwich shop nomination that I can fully get behind. Al's Deli is the epitome of Great Neighborhood Restaurant, serving a limited menu of high quality sandwiches (served on great bread) and soups on a quiet side street in Evanston. And, of course, their cookies are in a class by themselves. I'll give a big thumbs up for Al's GNR. It's great to see a place that hasn't changed much. I was at NU in the early 80's, and in the late 90's MrsF and I would do a sandwich delivery service for one of the Fencing Team's big fall tourneys, running to Al's and (for the banal) Burger King (NU didn't allow food sales at their venues not run by their designated vendor, who wasn't interested in fencing meets). The roast beef croissant, with bearnaise sauce and swiss, is a stellar sandwich. I hope they still make it. The other day, a friend and I were chatting about the fact that Al's would be a great GNR nomination. It's quirky, unique and serves excellent, distinctive food. I heartily endorse this nomination, which I am very happy to see. Al’s Deli is in my (work) neighborhood, and it’s a favorite treat for me. The sandwiches cost a bit more than I would normally spend on lunch, but their size and quality make them worth the price. 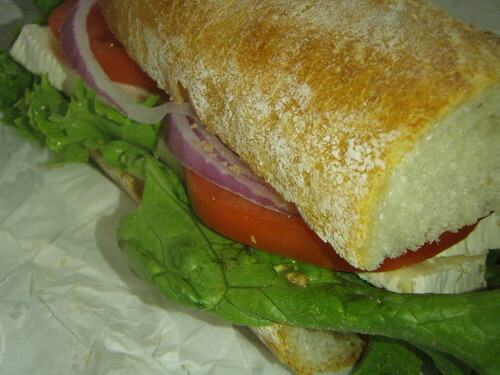 My favorite is the roast beef with homemade blue cheese dressing on a baguette with lettuce, tomato, and red onion. The roast beef is rare and neither tough nor salty, as so much sold at deli counters is, and the blue cheese dressing is wonderfully drippy, tangy, blue-cheesy salty and a great accompaniment to the roast beef. The baguette is fresh and chewy. Buy that sandwich and one of Al’s chocolate chip cookies and go sit in the park across Noyes Street on a nice fall afternoon. That’s a lunch! I fully support Al’s Deli nomination as a GNR. You know, this is a place I keep meaning to try and for one reason or other don't. Sad, because the owners used to be customers of mine back in the day. So I fixed that, right away. I need offer nothing more than the photos below and that my very happy stomach endorses this nomination. JoelF wrote: (NU didn't allow food sales at their venues not run by their designated vendor, who wasn't interested in fencing meets). My stomach and I fully, fully support this GNR nomination. I count Al's iced spiced cookies one of the reasons I work where I do (about a five-minute walk away), and I average a few cookies a month, with cravings the worst on Wednesdays (when they're closed). Sometimes I'll eat a sandwich with my cookie, and it's always the brie--very simple but with the most lovely, fresh ingredients. My love for Al's is deep. ett094 wrote: It is with great pleasure that I nominate Al's Deli in Evanston for a GNR. Al's has a good vibe, terrific sandwiches and is run by nice people, a solid contender for an LTHForum GNR. I think Al's is a classic archetype of a GNR. I don't comment on a lot of the nominations because I don't feel like I have enough experience with those places, but I've been going to Al's for a long time. While I don't go all that frequently, when I do go I am always pleased with the quality of the ingredients, the care used in assembling them, and the character of the place and its proprietors. It's a true classic. I strongly support Al's for a GNR. I felt bad having to schedule a meeting with students late on this beautiful Friday afternoon, so I stopped by Al's before the students arrived and picked up some treats to share. 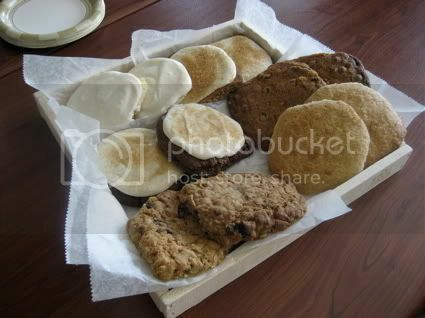 Iced butter and spice, chocolate chip, oatmeal raisin and orange spice... No leftovers. Took my Mother to Al's Deli for lunch today. It was the very first time I saw a notice that euro's would be accepted outside of a duty-free zone. We began lunch with the Basque Lentil soup. If I had realized the size of the sandwiches, we would have either split one or gone the soup and half a sandwich route. I had the Brie sandwich on a baguette that had very generous portions of cheese. My Mom had the roast beef sandwich with blue cheese dressing on a baguette. Her sandwich left a trail of blue cheese dressing across her face with practically every bite. She loved the sandwich so much, she abandoned plans to trade half her sandwich to me. Instead, she allowed me a bite and continued eating her sandwich. We shared a buttercream frosted pumpkin cookie that had real butter in the buttercream. They kept these cookies refrigerated before serving to preserve the frosting. Very glad this hidden gem for deli and Francophiles was nomimated. I hardly ever drive on Noyes and certainly would not have come across this hidden gem without this nudge. Mom and I plus our full tummies and pile of dirty napkins from the blue cheese dressing heartily endorse this GNR. You know, I forgot until just now that what I have pictured in my post is the cup of soup and 1/2 sandwich. I shudder to think what the size of a whole sandwich is - I assume it's on a full length of baguette? Mhays wrote: You know, I forgot until just now that what I have pictured in my post is the cup of soup and 1/2 sandwich. I shudder to think what the size of a whole sandwich is - I assume it's on a full length of baguette? I'd say it's about a foot long, based on my experience there yesterday, when we stopped in for sandwiches and cookies. You know, as good as their baguette is, their 7-grain bread is really special, too. A foot long it is, and quite delicious, too. No, the above picture is not the Izod gator escaped from a golf shirt, it's a freshly unwrapped beef & bleu cheese. It's not an easy sandwich to eat, but well worth the effort. My advice would be to order it with light bleu cheese dressing or even dressing on the side, which will be my request next time. Once you get beyond the overflowing dressing, it's a great sandwich. 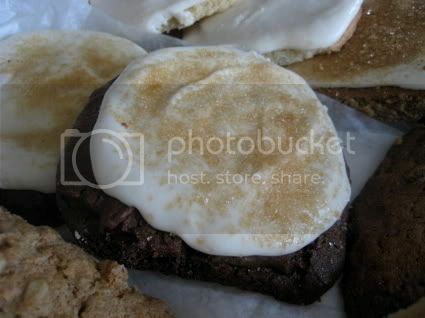 As I said upthread, as good as the sandwiches are, if you're a cookie lover, Al's should be high on your list. Here's a picture of my favorite. 1) The soups sometimes lack taste. I think they use a vegetable stock (at least some of the time), which is fine -- but it's not a very good vegetable stock. 2) I don't like the bread at all. Why they don't switch to Bennison's baguettes is beyond me. Other than that, I'm quite happy to have this place around as a great lunch option. We each had a half sandwich with a cup of soup. Soup of the day was the Basque Lentil. His sandwich: smoked turkey on the rosemary olive bread. Mine: roast beef with bleu cheese dressing (on the side) on baguette. The soup was tasty and warming on a gloomy Sunday afternoon. Both sandwiches were devoured happily with no tastes shared with the other. 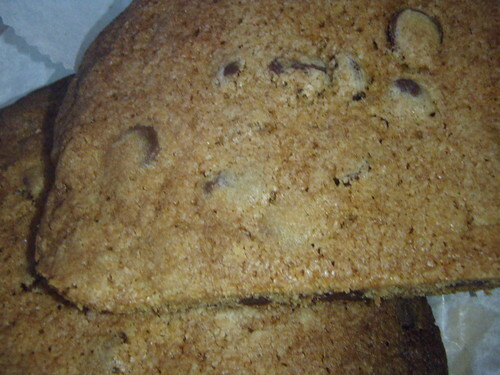 After devouring his chocolate chip cookie, Mr. X proclaimed it to be the best cookie he has ever had. That is a strong statement, to which I take no offense. The pumpkin cookie with cream cheese frosting was delicously cakey. Sated, we settled back to watch the Bears win. I visited Al's today after a two year accidental hiatus. On this beautiful fall day I had the Jarlsberg baguette, an iced sugar cookie and an orange sugar cookie... ate them while sitting on the hood of my car and listening to the kids in the playground across the street. All solid, to say the least. Al's, in my opinion, also happens to be one of the more romantic places around. You can keep The Signature Room or Geja's. Is that crazy? Perhaps. But in my experience bread, cheese, classical music - without pretension - have always been necessary swooning components. Throw in a couple of those cookies and it's a beautiful thing. Al's does everything right. The bread, the ingredients, the condiments, the accessories. I'm glad it's in my neighborhood. ChgoMike wrote: Al's, in my opinion, also happens to be one of the more romantic places around. You can keep The Signature Room or Geja's. Is that crazy? Perhaps. But in my experience bread, cheese, classical music - without pretension - have always been necessary swooning components. Throw in a couple of those cookies and it's a beautiful thing. My friends and I met up at Al's Deli for lunch today before the game. My smoked turkey sandwich with garlic aioli was delicious, fresh, huge, and messy! I agree w/ Cilantro though - the baguette is just too tough. It's a real work out on the jaw. I find the sandwich ingredients slipping and sliding. Toward the end of a sandwich half, I end up with a tiny piece of bread on the bottom and a huge piece of bread on top. I don't know how this happens. The butter cookies are awesome, but since they come out of the fridge, you have to let it come to room temperature a bit. Man, talk about flying under the radar. Here's a place that has one thread, one page dedicated to it, posts over the course of about two months, two years apart. But those posts represent, and this nomination thread, really show a lot of community love for Al's. And thanks, Mhays, for the links immediately above, which suggest that Al's is on the board in little ways that speak to the deep-seated affection its patrons have for it. A yes vote from me -- I think Al's Deli is the perfect GNR nominee. 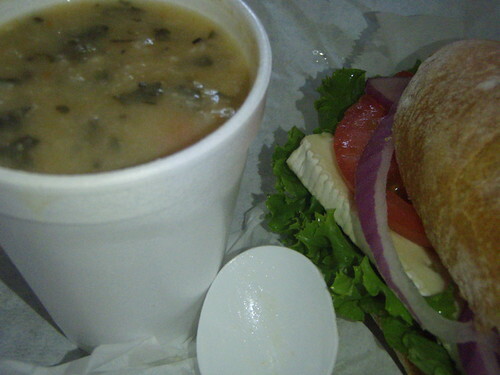 During a time in my life when I had to be at Evanston Hospital almost every week--and sometimes several times a week, I always scheduled my appointments so that I could stop by Al's on the way home for comforting soup and sandwich. I was never disappointed! One time in particular stands out: I was craving one of those jambon/fromage/beurre sandwiches that you can pick up anywhere in Paris (not a croque monsieur). It wasn't on the menu, but the brothers understood exactly what I wanted and put it together for me--and then we proceeded to have a delightful conversation about Paris.... It was exactly what I needed that day! The only bad thing about thinking what I wanted to say about Al's is that it's Wednesday--and they're closed today--so I couldn't run up there and get one of those roast beef sandwiches. Thank goodness that for almost 60 years, there's always been a tomorrow for Al's Deli!